Customers have long been wary of content sponsored by brands. This is probably because marketers have been trying to sneak it past them for years — the notorious “Sponsored Content” label, buried at the bottom in tiny font. The marketers from Lilly Pulitzer, Kahlua and Neiman Marcus — which have all been previously featured in MarketingSherpa case studies — found ways to be transparent about collaborating with bloggers and vloggers to promote their brands. The brands were also able to approach this content in such fun, creative and colorful ways that consumers didn’t really care the content was company-generated, causing customers to engage regardless of the source material. Read on to learn how to create sponsored content that actually interests audiences. 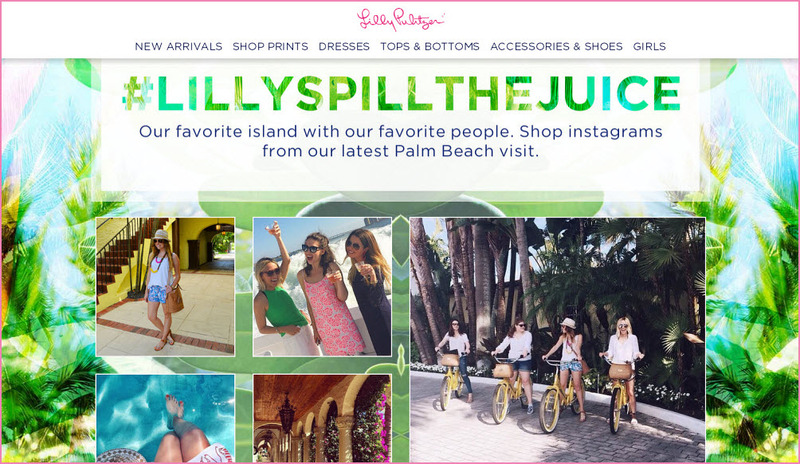 #Spillthejuice, the hashtag for the year, goes back to the brand’s origin story, which is the life of Lilly Pulitzer herself. Lilly Pulitzer was born into New York society and “could’ve lived a fancy life of galas and soirées and black ties and gloves. But she … was a real rule breaker,” Eleni Tavantzis, Senior Manager of Social Media Marketing and Public Relations, Lilly Pulitzer, said, adding that in her early twenties, Pulitzer eloped to Palm Beach, where her husband’s family owned citrus groves. The brand frequently collaborates with fashion bloggers, according to Eleni. To pull the brand’s theme and brand influencers together, the team puts together trips to create powerful brand content. “We’ve done two this year, two Lilly Spill The Juice influencer trips where we bring some of our favorite fashion bloggers and editors to Palm Beach with us to really experience what Lilly’s Palm Beach was like, which was not stuffy or fancy or full of rules,” Eleni said. During these influencer trips, the marketers create a lifestyle out of brand ideals and have bloggers live it out — all while wearing Lilly Pulitzer, of course. With the plethora of social media platforms out there, each with its own unique features and elements, it has become harder for marketers to leverage these social channels into successful campaigns. 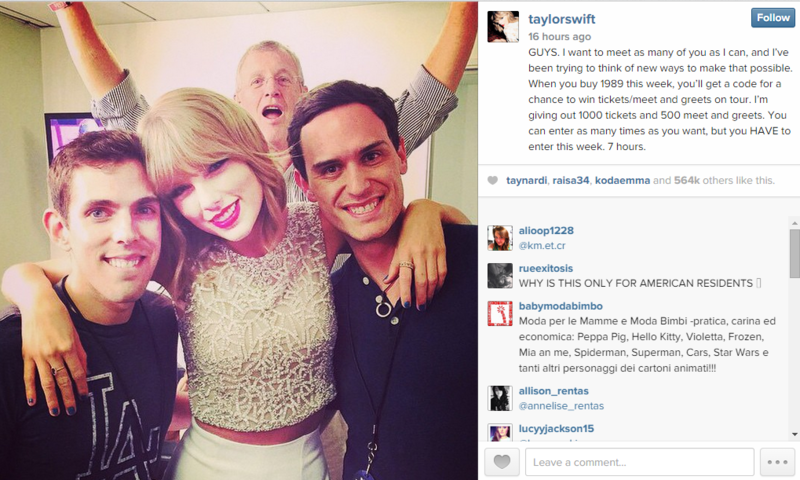 In social media channels, what sets failed campaigns apart from successful ones is innovation. The millennial generation (people born between 1980 and 1995), is quicker to adapt to new technology than older generations. We are usually the first on new social media platforms and the first to abandon them once something better comes along. Marketing using social media is a low cost investment that could have a high return. To specifically see this with millennials, focus on valuing innovation over consistency. Don’t be afraid to end a successful campaign right at its peak. This creates a strong “Fear of Missing Out” emotion. FOMO is a big emotional driver for millennials. It is the same drive that compels a majority of us to stand in line at specialty shops hoping to get our hands on a limited edition item to translate into bragging rights over friends on social media. The mark of a successful campaign is one that not only creates customers but also organic brand representatives. When using social media, marketers have discovered a lot of wrong ways to market to millennials and just as many right ones. The difference between them is learning how to strike a balance between sincerity and irony, detail and vagueness and new and unproven. Millennials in general love irony. Campaigns that are self-aware and poke fun at their own calls-to-action, while still sincerely telling you why you should buy their product over competitors, work better in social media than traditional campaigns. 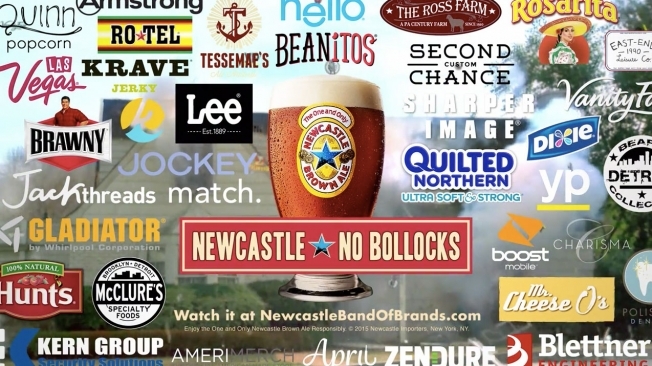 Newcastle beer company recently had a series of ad campaigns that poked fun at the traditional beer commercial featuring beautiful people drinking beer and having a great time. The campaign’s coup de grace was a Super Bowl ad making fun of how much money beer producers spend on Super Bowl ads by trying to put as many brands as possible into a one-minute commercial. The ad has been viewed 1.5 million times in two months and, through that, has probably increased Newcastle’s popularity with young adults. Social media for brands is all about developing a thriving online community of fans and followers that engage with your content and (hopefully) become brand ambassadors. To do this, your content must have that “engage-ability” factor: what will make your content or social presence something that your audience will want to share and interact with? Pizza is also something that we socially consume. Arguably, sometimes we don’t share it, but overall, when you have friends over or you don’t feel like cooking for your family, pizza is always a solid option. Social gatherings call for pizza. In a way, you could say that pizza and social media go hand in hand — they definitely do for Mellow Mushroom Pizza Bakers. 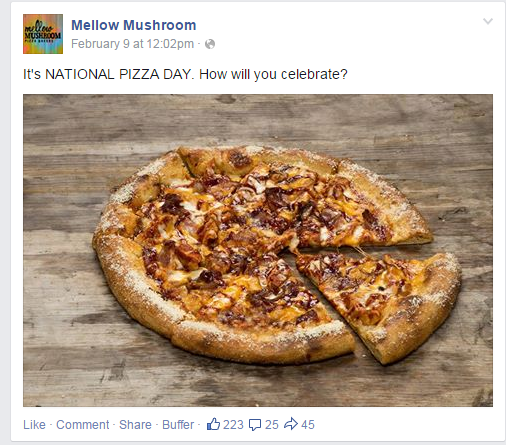 I recently had a chance to chat with Steven Sams, Digital Content Manager, Dusty Griffin, Senior Graphic Designer and Robert Pierce, Social Media Manager, all of Mellow Mushroom, for a MarketingSherpa case study about their work with the brand’s email marketing efforts. We had so much to talk about that I even asked the team for a second interview to discuss the brand’s social media efforts. Why? 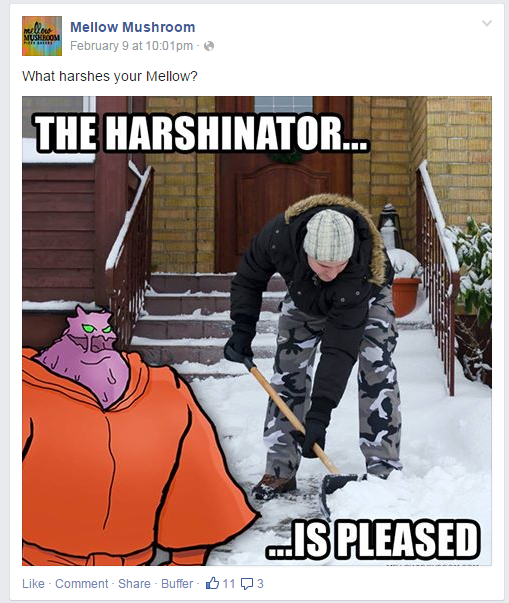 Mellow Mushroom has truly found a way to speak its audience’s language and cater to that via social media. Even if you’re not a pizza restaurant, there are still great lessons to be learned from Mellow Mushroom’s efforts. Read on for those, as well as the team’s top tips for interacting with an audience on Facebook. Steven explained that for Mellow Mushroom, Facebook is the main social media channel. With more than 172,000 followers on the platform, average posts will reach up to 2,000 people — sometimes up to 46,000. First, frequency is key. At the corporate level, the team aims to post twice a day. This was upped from once a day because of recent Facebook algorithm changes causing lower performance in posts. “We’re trying out some different things with our frequency because not many people are seeing them in their News Feed based on the algorithm. We thought we should post a little bit more,” Steven explained. Next, the time of day the team is posting is also important. If they are posting something food-related right before lunch or dinner time, they will entice followers to stop by Mellow Mushroom for their next meal. However, a busy time on Facebook is later in the evening, between 8 and 10 p.m., and the brand will post more quirky content. This content isn’t aimed at driving people to a restaurant to eat, but rather, to simply engage and entertain their base. 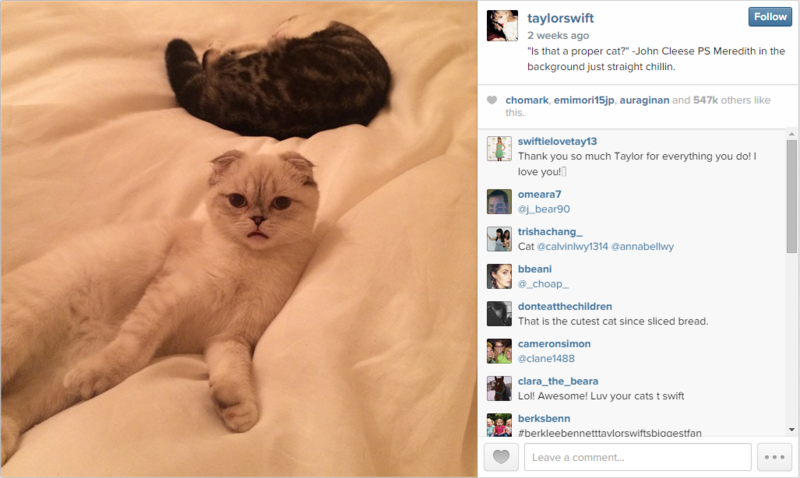 Taylor Swift uses Instagram just like I do. She takes photos of her cats, maybe takes a short clip of them jumping into boxes or snaps a photo of something that she baked that evening. But, unlike me, Taylor has 12 million followers. Aside from sharing her fascination with cats and baked goods, she also leverages Instagram to tease music she’s working on through behind-the-scenes glimpses into the recording studio or photos of lyrics that are yet to be released. The brilliance of marrying these two techniques is two-fold. Not only is she using Instagram to market her albums, but also the personal and fun posts on her Instagram account give fans a glimpse into her world. By inviting fans into her home, it makes them feel like they’re actually friends with Taylor. She makes her fans feel like they’re not too different than her (despite millions billions of dollars). This strategy is part of Taylor’s value proposition. She tries to make her fans feel like friends. To supplement this strategy, she hosts and personally appears at secret fan parties around the world for “all-star” supporters, making Swifties feel special just for being her fans (I’m still waiting for my invite, Tay). This is in stark contrast to the “arms-length” celebrities who keep themselves locked up in giant, fancy mansions in the Hollywood Hills with 12-foot ivy-covered fences and 24-hour security, quietly posting the occasional PR-induced Tweet. Recently, I went to visit some friends in Rochester, N.Y. While waiting for my flight out there, I started browsing Facebook on my phone. After perusing a few status updates and pet pictures, I landed on Ray-Ban’s Facebook page. Amidst the questions and comments, I saw a really nice pair of Clubmasters I like. While waiting for the return flight, I decided to catch up on some tweets from people I follow. Coincidentally, one person I follow tweeted about the same Clubmasters sunglasses I was looking at on Facebook a few days earlier and included a link. 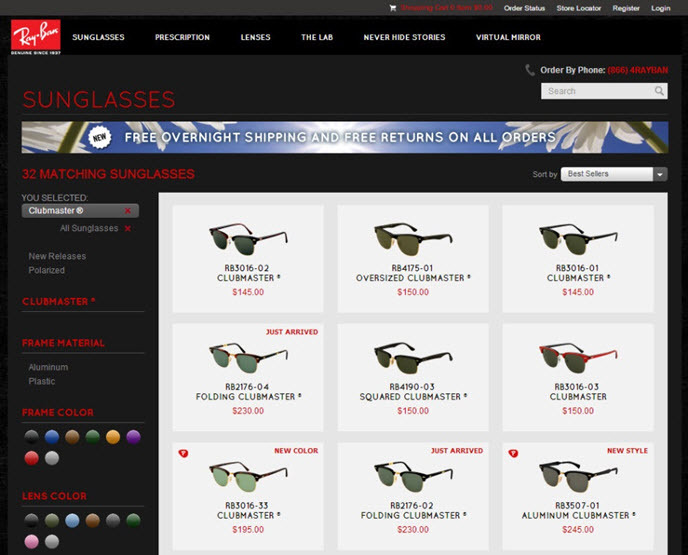 So, I clicked on it and was redirected to Ray-Ban’s e-commerce site. I spent a few minutes customizing pairs of Clubmasters to find the perfect combination to suit my tastes. I was tempted to order them, but it was time to start boarding – maybe some other time. A week later, I noticed a PPC ad in my browser for Ray-Ban. I clicked on the ad, visited its site again, and checked out a video on “Clubmasters Remastered.” I was about to order them for a second time when the phone rang. A few friends wanted to meet up at the Lemon Bar, a favorite dive for Jacksonville Beach locals. After a few margaritas, I got a wild hair and decided to finally purchase those Clubmasters. I got home and plopped down in front of my desktop computer, navigated to the e-commerce site I visited earlier, and bought those suckers! So goes the saga of the multidigital channel user and multidevice user, for that matter. What a mess! Is accurate attribution even possible? We have entered an era that presents new challenges for marketers. How do we accurately attribute credit for conversions with so many possibilities? When it comes to crediting digital channels, a number of attribution models exist that can provide clarity. However, when talking about social media, some models are better at accomplishing this than others. For example, social media is generally not a last click before a conversion. Therefore, basing a marketing budget solely upon this method would undervalue the contribution of social media to the conversion process. Google Digital Marketing Evangelist Avinash Kaushik wrote an excellent blog post on attribution modeling, addressing these issues. He opined the Time Decay Attribution Model does a fairly good job above and beyond the last click, and I would agree. Time decay assigns more credit to media that is closer in time to a conversion, rather than giving full credit to the touch point closest to a conversion as last-click does. In the Ray-Ban example, instead of Facebook receiving zero credit for my purchase, it would receive at least some credit even though it was my first touch point. This gives a much more realistic picture of how users are engaging versus a last-click model. Of course, it is the lesser of evils, not immune to biases. How should you attribute social media ROI? Now that we have a pretty decent way of attributing credit to digital channels beyond last-click, the next challenge is finding a way to accurately quantify the monetary value of social media. There are a number of businesses offering solutions on how to determine social media ROI. However, I am not aware of a totally foolproof method. It’s still like the wild west out there and one can become lost. To provide some direction, I’ve reviewed white papers and other literature floating around in cyberspace, piecing together the most compelling elements into a set of steps to estimate social media ROI that goes a little further than the methods I’ve mentioned. How does your social media stack up against paid channels? The idea of analyzing social media’s value here is by indirectly comparing similar paid channels to social media first. It’s like assessing what the cost of a social media page would be if it were equivalent to a banner ad, for example. We might multiply the number of Facebook page impressions by the typical CPM of our banner ad campaigns to calculate cost. A white paper I found offers six ways to measure social media and is responsible for that particular example, which I illustrate in Table 1 below. The article does a great job of laying out this concept for a number of social media platforms. Other sources have expressed similar approaches. I cheekily refer to the whole of them as “vicarious values.” It’s not quite catchy as an acronym, but it encapsulates the main idea well enough. It’s likely your business uses multiple social media sites, so you would need to account for the vicarious value of each social media platform to calculate total vicarious value. For simplicity’s sake, let’s assume our only social media presence is on Facebook. We can easily calculate social network revenue since Facebook’s vicarious value is the same as total vicarious value in this case. This is where time decay attribution comes in. So, for our example, we used data were taken from the Google Analytics Model Comparison Tool found under the conversions navigation menu. Facebook is our only social media platform. We can go ahead and assume Social Network (Table 2, Row 5) means only Facebook. Under the Time Decay Conversions column, we see 3,029.57 conversions were attributable to Facebook. The conversions attributable to Facebook (Social Network) amounts to 2% of the total conversions as illustrated below. From here, you can calculate revenue due to Facebook by applying an average sale price for your goods or services to the number of conversions as seen in the formula provided in Table 4 below. Now, do you remember that vicarious value we figured out in Step #1? By subtracting the vicarious value (labeled cost here) from the total revenue due to your social network, the remainder gives you the profit. From there, we have all of the pieces to estimate the ROI. These five micro-classes (each under 12 minutes) apply 25 years of research to help you maximize the impact of your messages in a mobile environment. Get 22 experiments MECLABS Institute analysts conducted in Research Partnerships to help improve conversion rates. Learn how MECLABS Services can help you overcome your toughest marketing challenges. The views and opinions expressed in this blog are strictly those of the author and do not necessarily reflect in any way the views of MarketingSherpa, its affiliates, or its employees.